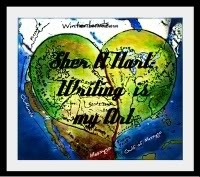 Be sure to stop on over to my blog Sher A. Hart: Written Art. Sher A. Hart is a children's, middle grade, and young adult blog. We feature great books, reviews, giveaways, promotions, and what ever else might interest our readers.Click on the image to stop on by!